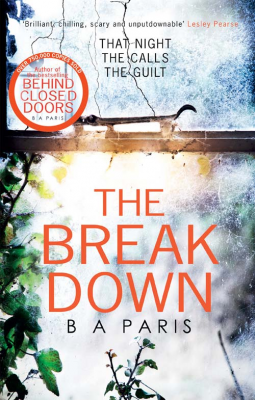 The Breakdown is BA Paris's second novel, and after such a strong debut (Behind Closed Doors), I have to confess I wasn't sure what to expect. I needn't have been concerned, the two novels are very different, but if anything, the Breakdown is even better than this authors outstanding debut. When Cass chooses to take a familiar short cut home from an end of term gathering down a darkened country lane. She thinks nothing of it. Her husband didn't want her to take the more dangerous route. But on a dark and stormy night, a short cut is exactly what Cass needs. She passes by what she assumes is a broken down vehicle on her way, stops to see if the woman inside needs any help, and after getting no response, assumes help is already on its way. So Cass is shocked and devastated the following morning to hear that the woman has died; the circumstances suspicious. Police are appealing for witnesses, but Cass is terrified that she will be in trouble as she didn't properly help the poor woman due to the appealing weather and her determination to get home quickly. Her guilt is all consuming, Cass feels awful about the whole thing. And then, the silent phone calls start. Is the murderer after her? Quickly Cass becomes a nervous wreck, dealing with anonymous telephone calls, an exasperated husband and an alarming spate of forgetfulness. Worried that she has early onset dementia like her Mother, as the pressure on her to remember important things mounts, Cass begins to slowly unravel. Behind Closed Doors is a novel full of suspense, paranoia and dread. The perfect psychological thriller with enough twists and turns to keep even the most prolific thriller readers thoroughly hooked. The Breakdown is available now via Amazon online and all good book shops.